Heralded prospects, featherweight Ruben Villa (8-0, 4KOs) and junior lightweight Michael Dutchover (6-0, 4 KOs) will return to action this Saturday night on the non-televised portion of an HBO Boxing After Dark® card at the Turning Stone Resort Casino in Verona, New York. Villa of Salinas, California will take on 103 fight veteran German Meraz in a featherweight bout, while Dutchover of Santa Fe Springs, California via Midland, Texas will fight Anthony De Jesus Ruiz in a junior lightweight contest. Villa and Dutchover are co-promoted by Banner Promotions and Thompson Boxing. Both are training in Santa Fe Springs, California and are ready for their 2nd appearances on the East Coast. Each fighter chimed in with thoughts on their respective battles. "Everything has gone good in training camp. I just fought four weeks ago, but I stay ready and that is the case now. I am ready for Saturday night," said Villa. Meraz is by far the most veteran opponent that Villa has faced. He has been in the ring with 25 undefeated opponents and 9 world champions. "I just need to be patient against him. He has over 100 fights and knows his way around the ring. If a knockout presents itself then I have to take it, but I want to display my skills." Being on a big card has the 20 year-old Villa excited, and he is looking to endear himself to the New York fight crowd. "I am excited to be fighting on a bigger show. It motivates me to do better and get on the broadcast someday soon. It is very exciting to be on these types of events." This will be the ninth bout for Villa in just fifteen months he is very happy about the progress of his career. "When I signed the plan was to be active, and that has been the case. I would like to get one more fight in this year. But I first I am very excited to put on a great performance on Saturday night." Dutchover has moved his camp from Texas to California, and the results have been very good as he heads into his bout on Saturday. "Everything is going great. I just fought last month, and I felt good. I am ready to go back to the east coast, and put on a great show." Like Villa, Dutchover was very impressive in his east coast debut on April 14th, and he is looking to cement himself as one of the top prospects in the junior lightweight division. "This is nothing new. I have fought on big shows before in the amateurs. The ring is my home. As long as I am in the ring, I will do my thing and put on an impressive performance." Even though Dutchover has very little to go on when it comes to scouting Ruiz, Dutchover is already a young veteran and is leaving no stone unturned. "I do not know much about him, but I am prepared for anything he will bring, and then I will adjust. I have had many different sparring partners with diverse styles, so that gets me ready for any opponent." "I planned for this, and I train hard. I am always ready when I get the call for a fight. I am glad that I have been busy, and I have been improving with each fight, and next year should be a good year in my career. I have a mentality that if I train hard, the fight is easy. When I get in the ring, I just like to have fun." Boxing returns to Macon, Georgia this Saturday, October 21st at the Shrine Temple as the Montgomery Brothers, Maliek, Mikhail, and Michael Jr, all guided by Witness Sports Management's Greg Hannely and Jared Shaw, look to prove why they're the future of boxing atop a stacked card in the heart of the south. All three brothers who were born and raised in Macon, GA, are featured in four-round bouts as Maliek Montgomery (1-0, 1KO) will face veteran Calvin Smith (2-11), Mikhail Montgomery (1-0 1KO), who will be making his pro debut, will face Tony Jones, as Michael Montgomery Jr. will face Edwin Aceves (Pro debut). As amateur boxers, the three brothers had an outstanding combined record of 419-44. 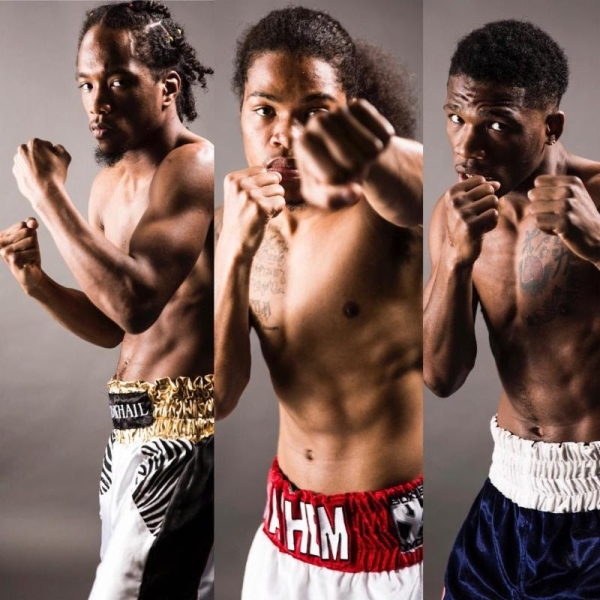 All three brothers are trained by their father, Michael Montgomery Sr.
"It is an honor to fight in Macon, Georgia, as we didn't have many boxing cards growing up out here, and it is a great feeling to help bring a professional boxing match to my hometown," said Maliek Montgomery. "This is a rare opportunity for my brothers and I show our hometown fans what we got, now that we are professional boxers." "I am proud to fight in Georgia and it is Macon, that makes it even better," Michael Montgomery Jr.
stated. "I am excited about this fight and wish it was fight night already. All I can tell you is get ready for a great performance as I'm looking to bring some heat when I step in the ring." "It is a great feeling to make my professional debut in my hometown and alongside my brothers and father," Mikhail Montgomery said. "We've all worked very hard for moments like this. With this being my pro debut, I'm looking to shine. This is going to be a fight you don't want to miss." "My boys are ready to show our hometown fans that they are elite fighters," said Michael Montgomery Sr. "No fighter out of Macon, Georgia has ever won a world title and my boys have a great chance to become the first to do so. I'm expecting a lot of family and friends to be in attendance. My sons are super excited to be fighting in Macon and everyone watching will know they are some rough boys, with some serious boxing skills." "The Montgomery brothers are special." said Greg Hannely. "They have a fan friendly style that I know will resonate with their hometown fans. In boxing, you want to see fighters that like to engage, and the Montgomery brothers are a perfect example of what action fighters should look like. These boys can bang." "The time has come where all three brothers will be fighting on the same card," said co-manager Jared Shaw. "The fact that this card is taking place in Macon, Georgia, is truly amazing. As managers, you always want to build a solid fanbase in the city where the fighter is from. In this case, we got three bonified fighters, fighting in their hometown. Real fighters, fight, and Macon is going to be proud to call the Montgomery's their own." Tickets are $25 for general admission and $45 for seating. For tickets please contact (478)319-1502.